← Run From the Hills – to a winery! Good morning from sunny Hobart! Well, Hobart is somewhere over the other side of that hill in the background. And yes I am in a t-shirt and bare feet, and its glorious! 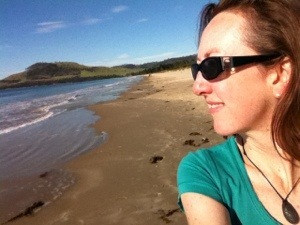 I’m on seven mile beach, east of Hobart – it’s near Sorrel I think. I woke up early with aches and pains from yesterday’s run, despite a good nights sleep at the fancy schmancy Wyndham Resort where I’m staying for a few days with my parents, aunt and uncle. After a soothing bath, and finding the olds all still asleep I decided to come check out the beach and do some cartwheels. As you do! It helps loosen up my shoulders and neck. Wow, totally worth it. I really miss the beach. And I love Tassie! Looking to forward to whatever the next three days have in store. This entry was posted in Uncategorized and tagged Hobart, seven mile beach, Sorrel, Wyndham Resort. Bookmark the permalink.